University of Southern California’s Graphics Lab has presented a volumetric 360 degree 3D display at SigGraph 2007 which is suitable for multiple simultaneous viewers. The display is also used in a 3D Teleconference prototype. 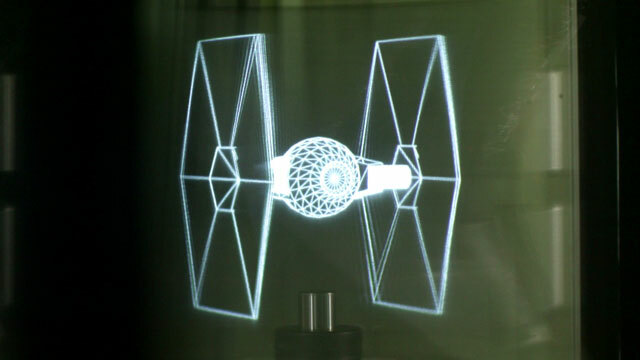 The system works by projecting high-speed video onto a rapidly spinning mirror mounted at 45 degrees. As the mirror turns, it reflects a different and accurate image to each potential viewer. Our rendering algorithm can recreate both virtual and real scenes with correct occlusion, horizontal and vertical perspective, and shading. Horizontal parallax is naturally represented, yet correct vertical parallax requires user tracking and is therefore restricted to a single viewer. A high-speed DLP video projector with a custom-made FPGA displays 5,000 images per second of interactive 3D graphics, projecting 360-degree views with 1.25 degree separation up to 20 volume updates per second.